Moving account of the one-woman phenomenon who, among other things, made the unhappy Franz Kafka’s final year a little less miserable. 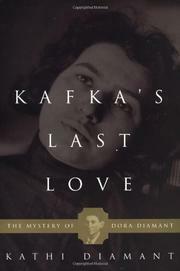 Many standard biographies of Kafka have little or nothing to say about Dora Diamant (1898–1952), a free-spirited woman who left her Polish Hasidic family to work as a Zionist activist, sometime film actress, bookseller, all-around cultural force, and flame of many a man’s desire. Yet Diamant, states namesake (but no known relation) Kathi Diamant (Kafka Project/San Diego State Univ. ), sparked something in Kafka from their very first meeting in Berlin in 1922. Through her influence, the desperately ill writer lightened up just a little, and their late-into-the-night whisperings about moving together to Palestine seem to have helped him cope with the daily sufferings brought about by wasting tuberculosis. Kafka kept his relationship with Dora private, save for a mention or two in postcards to his friend and later biographer Max Brod, who upon meeting her characterized the relationship as “an idyll. . . . At last I saw my friend in good spirits.” Dora was Kafka’s constant companion, and Diamant maintains that he died in her arms. (Other sources either do not record this datum or have it that she was out of the room when he slipped away.) After his death, Dora safeguarded Kafka’s papers and manuscripts, destroying some of them as he asked, but keeping others that fell into the hands of the Gestapo and have never been recovered. She fled to England and was interned as an enemy alien until, thanks to some literate intercessor’s recognition of her relationship with the writer, she was allowed to move to London, where she died—but not without first traveling to Israel and saying a prayer for her old lover. A welcome, well-written addition to Kafka studies, valuable in its portrayal of the writer as a human being, not a monument.